Resolution is a term associated with all types of photography. It has several different meanings depending on the context in which it is used. With regard to digital cameras, resolution (also called image capture resolution) refers to the number of pixels in the camera sensor. A camera with 3 megapixels has a sensor with 3 million pixels. A pixel in a sensor is a single element of the sensor that will record the smallest element of the image. The more pixels in a sensor, the higher the resolution of the image. With regard to digital printing, resolution refers to the number of dots in a given distance, usually dots per inch, or DPI. The more dots per inch, the higher resolution of the print. With regard to vertical aerial photography, resolution (also called ground resolution or ground sample distance) refers to the area of ground covered by an individual pixel. In an image with 6 inch ground resolution, each pixel records the average reflected color of an area 6 inches by 6 inches. The fewer inches per pixel, the higher the resolution resolution of the image. The selection of a desired ground resolution is an important factor to decide when ordering vertical aerial images. Several examples of various ground resolutions and considerations are presented on this page. 1 meter (36 inch) resolution is considered high resolution for satellite imagery. It is useful for surveying very large areas. Details that can be seen at this resolution include roads, average color of crops and forests, buildings, large infrastructure features and large waterways. 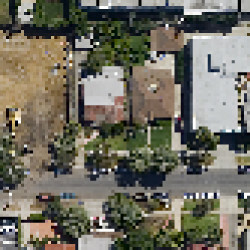 12 inch resolution is the industry standard for most archived large area image databases including Google Earth. It displays much more detail than 1 meter resolution. Details that can be seen at this resolution include vehicles, roads and some markings, individual crop rows, large trees and details on buildings. 6 inch resolution is considered high resolution for aerial photography. This resolution is occasionally available from archives but is usually produced on a custom basis. Details that are visible at this resolution include individual small trees and plants, individual vines and other crops, vehicle types, power poles and other infrastructure details, road markings and lettering. 3 inch resolution is very high resolution for aerial imagery. Details that can be seen with this resolution include power lines and other very small infrastructure details, individual people and animals, currents and waves in water, fine details on roads including markings and skid marks. 1 inch resolution is about the highest ground resolution available today. Street markings are very clear and legible. This resolution provides detail 9 times greater than 3 inch. Focal Flight has shot areas up to 80 square miles at this resolution providing the user the highest available detail in their imagery.